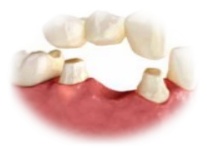 A bridge is a solution for a missing tooth where the teeth either side are prepared for crowns and a replacement tooth is bonded in between them to fill the gap. The use of dental implants means that there is now less of a need for these restorations. 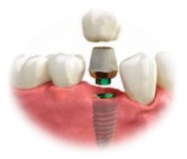 The final crown is made out of a biocompatible metal, ceramic or a combination of both.